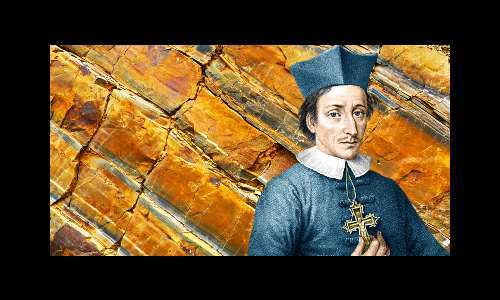 Nicolas Steno was one of the founders of modern geology, establishing in 1669 some of its fundamental principles, including the basic law that in layers of rock the oldest layers are found at the bottom and the youngest layers at the top. Steno also made notable contributions in the fields of anatomy, crystallography, and paleontology. He became a Catholic bishop, and died in self-imposed poverty. In 1988 he was beatified – the third of four steps needed to be declared a saint. Discovered that the heart is ordinary muscle, not the body’s center of warmth as promoted by Galen. Discovered the parotid duct or Stensen duct that carries saliva into the mouth from the major salivary gland. Steno dissected a very large shark’s head in 1666, noting the similarity between the shark’s teeth and ‘tongue stones’ found in rocks. Most people believed ‘tongue stones’ grew naturally within rock formations. Fabio Colonna had advanced a different theory in 1616, when he said the ‘tongue stones’ were actually the teeth of ancient sharks. Steno agreed with Colonna, arguing that the chemical composition of the sharks’ teeth had changed – turning to stone – since the time they were first embedded in the rock. A year earlier, in 1665, Robert Hooke used his microscope to discover cells in fossilized wood. He concluded that fossils had once been living creatures whose cells became mineralized. This law says the angles between the faces of a given species of crystal are constant and are characteristic of that species, regardless of the origin and size of the crystal. Published the book Dissertationis prodromus in 1669, defining for the first time the principles of modern stratigraphy. The principle of original horizontality: All layers of rock are deposited horizontally, parallel to the horizon. Later they may be deformed so they form an angle with the horizon. The law of superposition: The deeper the rock layer, the older it is: when there are different layers of rock, provided there has been no deformation, the oldest layers are at the bottom and youngest at the top. The principle of lateral continuity: Rock layers extend laterally in all directions. Where similar layers of rock are separated, for example by a valley, it can be assumed these rock layers were originally continuous. The principle of cross-cutting relationships: Any geologic feature that cuts through another is the younger of the two features. Nicolas Steno’s birth name was Niels Steensen. Niels was born in Denmark’s capital city, Copenhagen, on January 1, 1638. His father was Steen Pedersen, a goldsmith. His mother was Anne Nielsdatter. Between the ages of three and six, Niels suffered continuous ill-health and was kept apart from other young children. He learned to enjoy the company of older people, finding their conversations more enlightening and satisfying than those of younger companions. He also learned to associate with people he regarded as noble, while avoiding people he regarded as lazy or menacing. He enjoyed hearing about religion. His father died when Niels was six. His mother married another goldsmith. Niels was well-educated in Latin, Greek, Mathematics, and Modern Languages at a grammar school. In 1656, at age 18, he enrolled with the Latinized form of his name, which in time became Nicolas Steno, as a medical student at the University of Copenhagen. After four years at university he traveled to the Dutch city of Amsterdam for four months, where he made his first major discovery, the parotid duct, which carries saliva. This was the beginning of a restless period in which Steno traveled around many European countries. In 1666, age 28, he was appointed Professor of Anatomy at the University of Padua, famed throughout Europe for its anatomy courses. William Harvey and Andreas Vesalius both studied anatomy there. While working at Padua, Steno impressed Ferdinando II of Tuscany, a member of the (in)famous Medici family, becoming his personal physician in the city of Florence. There Steno enjoyed intellectual discussions with Francesco Redi, the founder of modern parasitology, who was also a physician to the Medici family. In 1667, after meeting the Pope and watching religious ceremonies, Steno converted from Lutherism to Catholicism. In 1669, he published his most famous work, Dissertationis prodromus, founding modern stratigraphy, and establishing his place in history as one of the founders of modern geology. In 1671, age 33, he returned to his alma mater, the University of Copenhagen, as Professor of Anatomy. In 1675, Steno took Holy Orders. The following year, Pope Innocent XI, impressed by Steno’s determined efforts to convert other Lutherans to Catholicism, made him Bishop of Titopolis and Apostolic Vicar of Northern Germany and Scandinavia. In 1684, age 46, Steno arrived in Hamburg in Germany. There he deliberately lived in a state of poverty, which annoyed Protestant and Catholic citizens alike. They threatened to cut off his nose and ears or kill him. Steno moved to the German city of Schwerin and there he continued to live in deliberate hardship, becoming emaciated. Nicolas Steno died, age 48, of intestinal trouble in Schwerin on November 25, 1686. At the request of the Medici family, his body was taken to Florence in Italy, where it was buried in the Basilica of San Lorenzo. In 1988, he was beatified by the Catholic Church – the third of four steps needed to be declared a saint. "Nicolas Steno." Famous Scientists. famousscientists.org. 15 Mar. 2018. Web.